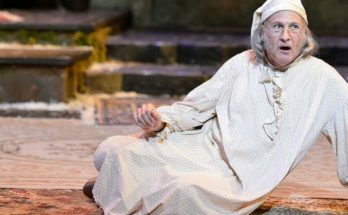 The world premiere musical “Troubadour” debuts at the Alliance Theatre on Jan. 18 and runs through Feb. 12. Details, tickets HERE. GRAMMY AWARD-WINNING recording artist Kristian Bush has been “secretly writing songs connected to each other forever.” (For him, “forever” means since 1983, when he was 13). 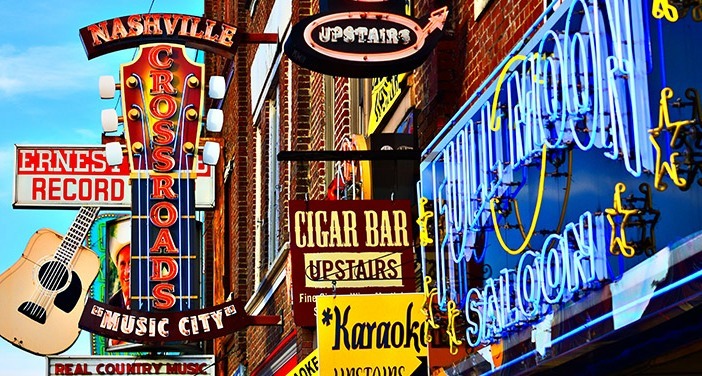 The city lights of Nashville. “I just never thought that my songs would go together into one musical,” he says. But playwright Janece Shaffer came calling. She had an untitled play she wanted to musicalize. That Bush was the right collaborator “came at me from every angle,” Shaffer says. The Atlanta singer, who plays any stringed instrument you can name, had the versatility, sound, style and sensibilities for her script about a turning point in country music. The songman, who partners with Jennifer Nettles as the country music duo Sugarland, met Shaffer last year at the Flying Biscuit Café in Candler Park. Over breakfast, she shared the story of her new play, set in Nashville in 1951. 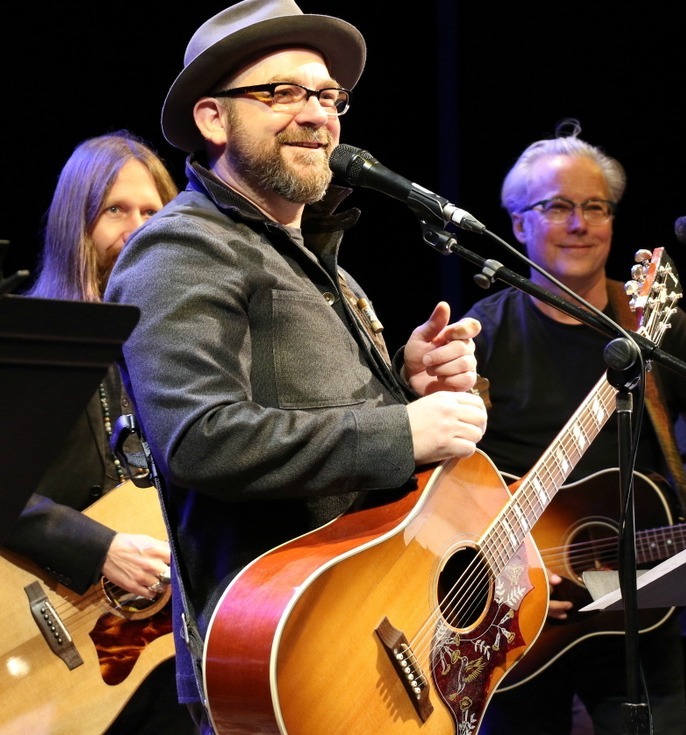 Kristian Bush performs “Troubadour” songs at a preview concert. She gave Bush the lowdown on the piece now titled Troubadour. The musical is the Atlanta native’s seventh play to premiere at the Alliance Theatre. 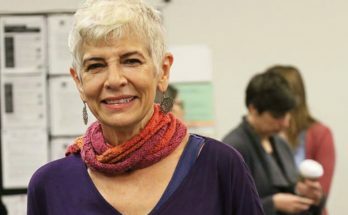 Alliance artistic director Susan V. Booth directs. Bush’s younger brother, Brandon, is music-directing and is part of the onstage band. Troubadour follows the intersecting lives of folks in country music. Billy Mason, an old-school singer, is retiring. Billy’s son, Joe, has always performed by his dad’s side but also in his shadow. Inez is a young woman just off the bus from Tuscaloosa, Ala., with little to her name but a notebook full of original songs. Izzy is a scrappy and ambitious Russian-born tailor who thinks that country music artists should wear sparkly costumes. Shaffer’s piece so inspired Bush, she says, that “he sat there going ‘I hear it, I hear it,’ and wrote the first song before the end of breakfast.” That song, “Father to the Son,” is the first in the show. 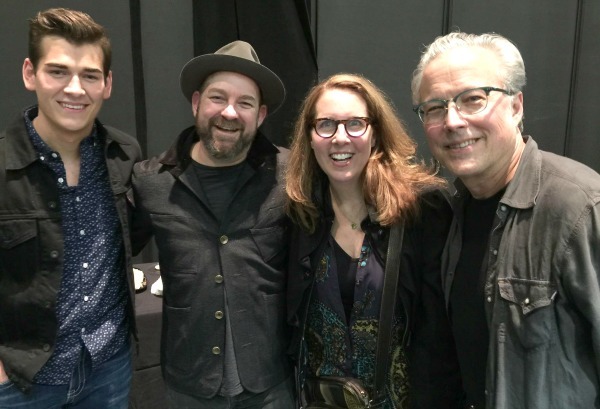 Actor Zach Seabaugh (from left), songwriter Kristian Bush, playwright Janece Shaffer and actor Radney Foster. Photo: A’riel Tinter. Shaffer laughs, because Bush even wrote songs for a couple of titles she tossed into the script. She gave Billy a hit she called “White, White Steeple in a Blue, Blue Sky.” That didn’t have to be the song title, but before long, Bush had written the tune. That story took root for her during a weekend getaway to Nashville with her husband, Bill Nigut. A costume exhibit at the Country Music Hall of Fame and Museum featured such Western-wear tailors as “Rodeo Ben” Lichtenstein (1893-1985) and Nudie Cohn (1902-84). Both were immigrants who designed for the likes of cowboy singer Roy Rogers. 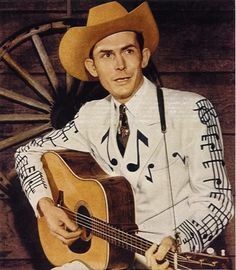 Cohn, in fact, is credited as the first to add rhinestones and fanciful designs to outfits worn by country legends like Hank Williams Sr. Sometimes a writer just needs to be swept up by an idea, Shaffer says. 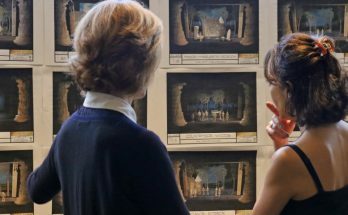 For The Geller Girls, her 2015 world premiere at the Alliance, she dug deep into the history of Atlanta’s 1895 Cotton States Exposition. For Troubadour, she studied the changing tides of country music in the mid-20th century and the tailors of the moment.